Stan Lock, left, with Boyd Dingus, General Manager of ESTROTECT. Sunday morning the AI Industry lost a real pioneer. Stan Lock was a real cowman that understood the science and practical aspects of breeding cattle by artificial insemination. During his long career he understood ranchers and what they wanted and expected. He worked closely with University researchers in estrus synchronization protocols for everyday use. He shared his knowledge and expertise, freely training many new people in the industry. 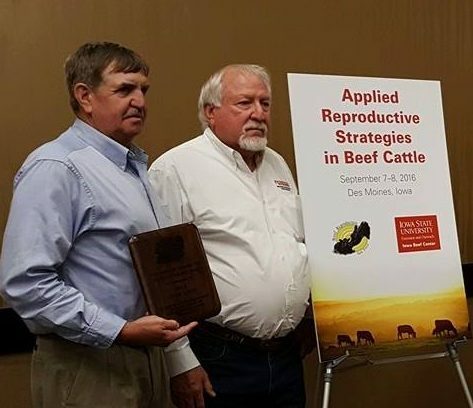 Stan was a long-time member of the Applied Reproductive Strategies in Beef Cattle group and actively participated. 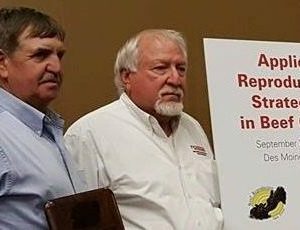 He was also one of the first to Receive an award from ARSBC for his contributions for teaching and developing the next generation to follow him. This cowboy has left a legacy of customer service and education with a lot of young people in the AI Industry. Stan will be missed but his work will go on through his disciples. A lot of people are glad to have called Stan a friend!